Leadership offerings from a social entrepreneur, a researcher of diverse ways of making meaning, and a firm believer in active-compassion and purpose. 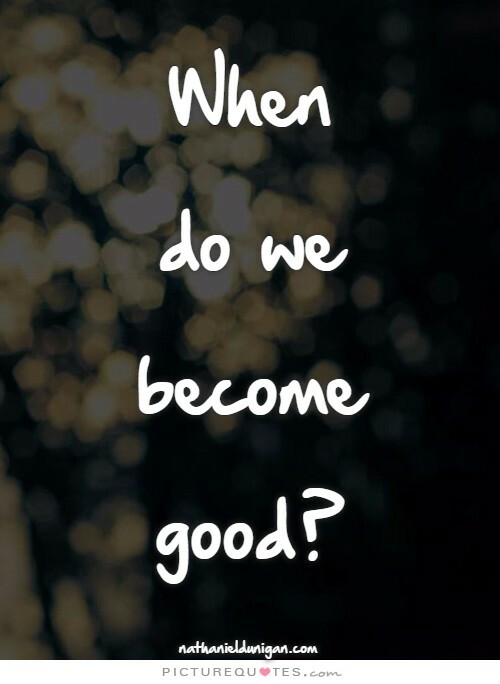 When do we become good? On a recent episode of NPR’s “This American Life,” this question was posed: “When do people become bad?” A professor very wisely replied that he thought that this was the wrong question. He offered instead that the question should be: When do people become good? I think I agree. Perhaps our focus on the “bad choices” we make–that others make–is a mistake. When we divide ourselves up according to that criteria, maybe we’re missing the more important building blocks of life: good choices. We are born to be concerned only about self. We feel we must worry about what is best for ME. After all, who else will? It often seems that the preservation of Self is paramount. But if we open a window to the possibility that our personal purpose is rooted in a notion of care for, in protection of, or in sacrifice for someone else–then the silliness of life transforms into a scared task with which we have been privileged. I certainly have been caught in the selfishness trap in the past. And every time, the emancipating moment emerges from the intersection of self-respect and compassion-for-others. There is indeed danger in dwelling in one camp or the other (that is the camp of self-respect or the camp of compassion). So what we are left with is this question: When do we become good? It seems we are constantly looking over each other’s shoulders–in social media, in politics, at work, in families, at parties, and at church–looking for evidence of evil. What if we transitioned to looking for good? For me, the God-piece helps give language to this notion. What works for you? ← Q: Why should I give to charity when there are so many billionaires? What I often marvel at is when someone who has been deeply victimized rises out of those ashes to have amazing compassion, courage, and fierceness to help others. The healing of these wounds can turn to human gold!! While I do not think that people are inherently “evil,” neither do I believe that “goodness” automatically emerges from our existence. The more I study–and the longer I live–the more I realize that pure goodness is always the product of intentionality. Having trouble remembering the MDG’s? Do you participate only as a leader? Click here for information about AidChild, the organization I founded in Uganda.